We have good options for angle and end boots here at PlumbersStock. When it comes to HVAC applications, the right components can mean big savings for you on utilities. Get the best duct boots online. We carry a huge selection of discount single-wall fittings. HVAC boots may be the perfect solution for your duct and vent system, so do some homework and/or contact us about choosing the right HVAC fitting for your needs. When installing a new HVAC system, there are several parts that are a must-have to make the system work properly. One product that is essential to your central heating and cooling is the duct boot. Also known as an HVAC boot, there is some confusion about what exactly the boot is, and what it does, but we at PlumbersStock are here to alleviate that concern. Read on for helpful information. We offer discount Deflect-o HVAC boots, and other brands, that come in different shapes and varieties designed to meet the needs of almost any consumer. What Is a Duct Boot? HVAC boots are made of galvanized sheet metal and are designed to convert ductwork into a vent to heat a room. In a home, the trunk of the HVAC system either runs through the ceiling or the basement of the home. The trunk consists of the main ductwork line that supplies all the air throughout the house. From the trunk, there are lines that branch out the run to each room in the home. These lines usually use round duct pipe or flex duct pipe to carry the air to each room. 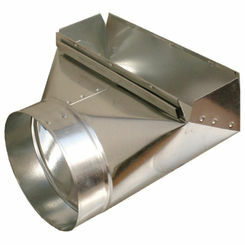 To run the air most efficiently into each room a duct boot is needed. A boot is a fitting that is circular on one end and rectangular on the other, which allows it to connect to the round pipe and is framed into the floor or ceiling where the rectangular part is faced towards the direction of the room. Once the floor or ceiling has been completely installed then a vent is placed in the boot resting on the floor or ceiling, creating a finished look. Boots are available in a variety of different options. The three most common types of duct boots are angle, end, and straight boot. 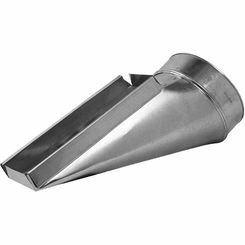 The angled boot provides a ninety-degree angle, which allows the ductwork to change directions from horizontal to vertical. 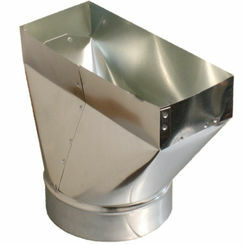 An end boot is used with terminations, in other words, it simply converts the ductwork into a vent. 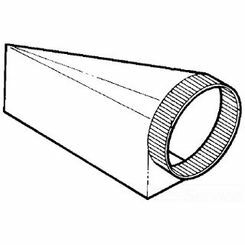 The last is the straight boot, which is used when the ductwork is already running straight and then converts it into a vent. Along with the different duct boot types, there is also a wide selection of different boot sizes. This is a necessary distinction to consider as there is not a standard duct or vent size. It also allows you to select the vent size you would like depending on the size of the room. HVAC boot sizes include 5”, 6”, 7”, and 8”, diameter so you can select the size that best coordinates with your system. For all your HVAC needs, including duct boots, be sure to check out the products on PlumbersStock.com. These boots come with a variety of different sizing and type options so you can complete your custom heating and cooling system with ease. For more information on angle and boots, as well as other fittings, please contact our customer service professionals.